If a wheel is bent, cracked or heavily corroded, it should be replaced. Otherwise, the tire may separate from the wheel or cause a loss of handling control. When replacing wheels, care should be taken to ensure that they are equivalent to those removed in load capacity, diameter, rim width and inset*. Replacement wheels are available at your Toyota dealer. *: Conventionally referred to as “offset”. ● Use only Toyota wheel nuts and wrenches designed for use with your aluminum wheels. ● When rotating, repairing or changing your tires, check that the wheel nuts are still tight after driving 1000 miles (1600 km). ● Be careful not to damage the aluminum wheels when using tire chains. ● Use only Toyota genuine balance weights or equivalent and use a plastic or rubber hammer when balancing your wheels. ●Do not use wheels that are a different size from those recommended in the Owner’s Manual, as this may result in a loss of handling control. ●Never use an inner tube in a leaking wheel which is designed for a tubeless tire. Doing so may result in an accident, causing death or serious injury. 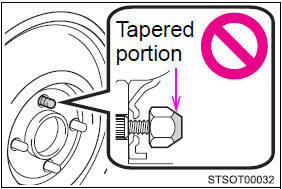 ●Be sure to install the wheel nuts with the tapered end facing inward. Installing the nuts with the tapered end facing outward can cause wheel to break and eventually cause a wheel to come off while driving, which could lead to an accident resulting in death or serious injury. ●Never use oil or grease on the wheel bolts or wheel nuts. Oil and grease may cause the wheel nuts to be excessively tightened, leading to bolt or disc wheel damage. In addition, the oil or grease can cause the wheel nuts to loosen and the wheel may fall off, causing an accident and resulting in death or serious injury. Remove any oil or grease from the wheel bolts or wheel nuts. ●Because tire repair or replacement may affect the tire pressure warning valves and transmitters, make sure to have tires serviced by your Toyota dealer or other qualified service shop. In addition, make sure to purchase your tire pressure warning valves and transmitters at your Toyota dealer. ●Ensure that only genuine Toyota wheels are used on your vehicle. Tire pressure warning valves and transmitters may not work properly with non-genuine wheels.